The Cruze offers a perfect balance of form and function making it an ideal choice for commercial office spaces, schools, hospitals, retail areas and so much more. 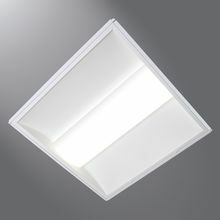 It is a well-constructed, recessed fixture with quick availability and affordable pricing, combined with its stylish architectural look, this fixture will be an ideal solution for day-to-day requirements as well as competitive project situations. Metalux Cruze luminaires with LED technology are available with an optimal integrated sensor system, optimized to meet energy codes for occupancy sensing and daylight harvesting.